This is affectionately known as Chocolate Squish Cake and is a cake to impress. Not only can you unleash your creative decorating skills, (or in my case, no decorating skill at all! ), you have the most delicious cake to share. To eat the cake I dare you to engage your inner child and use your hands. When the slice is all gone enjoy licking the oozy cream off your fingers! 1/4 to 1/3 cup coconut sugar (sifted to remove large granules) or raw honey or pure maple syrup. Note the amount you use depends on tastes – the less sweetner the better. Preheat oven to 350F or 175C. Line a 9 inch/20cm cake tin with parchment/cooking paper. Melt the butter or oil in a saucepan on low heat. Stir in the sifted cocoa powder until mixture is smooth and remove from heat. In a large mixing bowl, beat or whisk the eggs, coconut sugar or honey, salt, baking powder & vanilla essence. Pour cocoa/butter or oil mixture into the egg mixture and mix well. Pour batter into cake tin. Bake at 350 degrees for 18-23 minutes depending on your oven. Check after 16 minutes , cake is cooked when a skewer/tooth pick inserted comes out clean. Remove from oven, let cool in pan for 5 minutes then carefully remove and cool on a cake rack. Once cooled place on a board and very carefully cut in half through the middle. Best to use a serrated or bread knife for this – take your time! Place bottom half on a serving plate and pile on ½ of the Strawberry cream. Gently place the top on and coat with the remaining strawberry cream. Reserve the 3 large strawberries to decorate. Slice the remainder and in a small pan and heat to a very gentle simmer. Add coconut sugar/honey or stevia and taste for sweetness. Once berries are soft and mushy, remove from the heat and set aside to cool. Reserve 2 tbsp of the strawberry juice. Slice the reserved strawberries, place in a small bowl and spoon over the reserved strawberry juice to glaze. Whip cream until stiff and gently mix in the cooled strawberries. 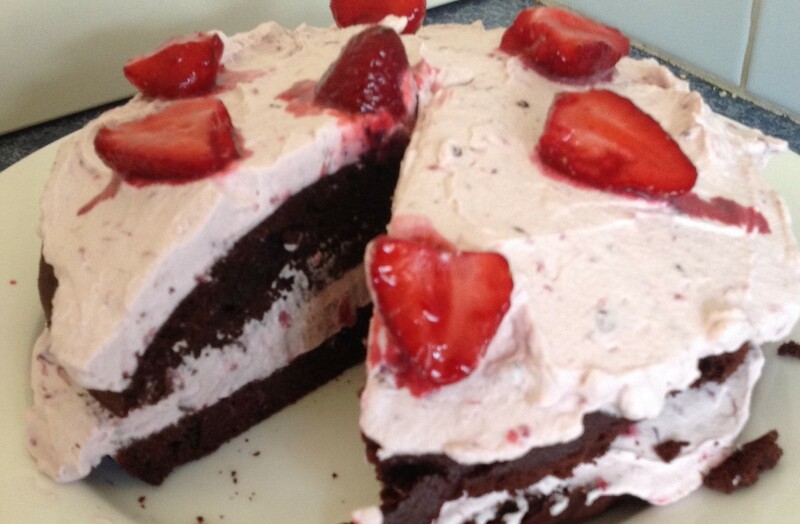 Place strawberry cream mixture and the separate sliced strawberries in the fridge until cake is ready to decorate. The inspiration for this cake came from two wonderful Paleo bloggers, the cake from the unrefined kitchen and the strawberry cream from the Foodie and the Family.